It is strongly recommended that the Finbrella be closed in winds gusting above 35 kph (20 knots) whether permanently anchored or not. Finbrellas are designed to be structurally resistant to wind speeds well in excess of 35 kph (20 knots) when immovably fixed to the ground in a vertical position. But remember - winds are fickle! Wind speeds, directions and forces can vary from one moment to the next. Buildings and other topological features will further distort wind speeds and directions. Wind gusts can often be up to 50% faster than prevailing average wind speeds. It is the responsibility of the Finbrella owner to make prudent judgment about wind speeds and when it is sensible to close the Finbrella. The Finbrella is a dynamic shade umbrella that is constantly aligning itself to the immediately prevailing wind direction contacting its canopy fin. 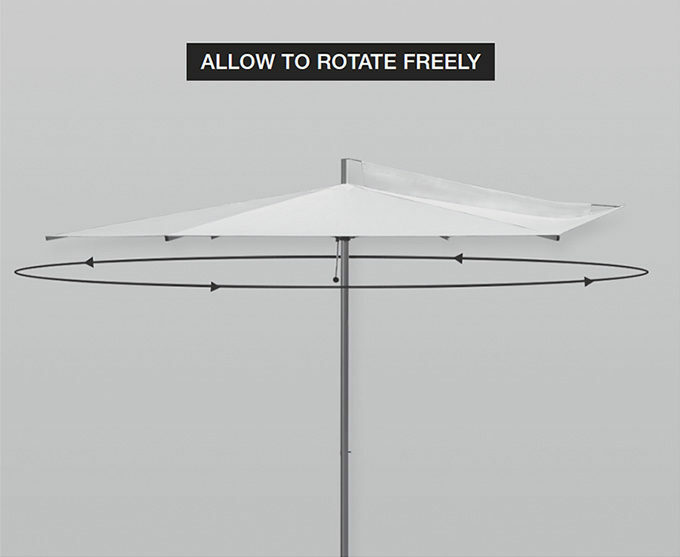 The canopy must be allowed to rotate freely in response to wind directions. Immediate wind speeds and directions can vary markedly from one moment to the next resulting in sudden changes in rotation speed. Clearance for the rib ends and the upper pole locking mechanism button must be provided to avoid injury or damage.